OK, I know I was supposed to be sharing another koala card today, and I swear I will, tomorrow. But today I got distracted by another project and a sick 5 year old today. Between water bottle refills and cuddles I couldn't stop messing around with this project for CTMH's new weekly artistic challenge. So I have this running embroidery hoop project going, for a wall display I'm building in my stamp room. When I saw this week's challenge to make a scrapbook page with our new year's resolutions I knew I needed to make a new hoop. I don't do resolutions, but I've already said to a few friends that my motto for 2015 is gonna be Choose Happy. As a mom of three little boys I find myself saying "yes" to a lot of things I don't really want to do...but this year I want to focus on choosing activities that will be happy for my family, friends, and myself. I know I'll need a reminder, since I find it hard to say no, so I used the sketch over at Sketchabilities (a bit loosely, since I'm scrapping into a circle), pulled a few photos that make me smile, and fancied up my motto with lots of scrappy things that make me happy. Now it's hanging on the wall in my stamp room, making me smile every time I glance over there. I wove the background from pretty much every bit of Slate Polka Dot Ribbon I had left in my stash and a lot of Beacon's 3 in 1 adhesive. Then I sprayed a large splash of silver glitter and traced some circles with a white paint pen. 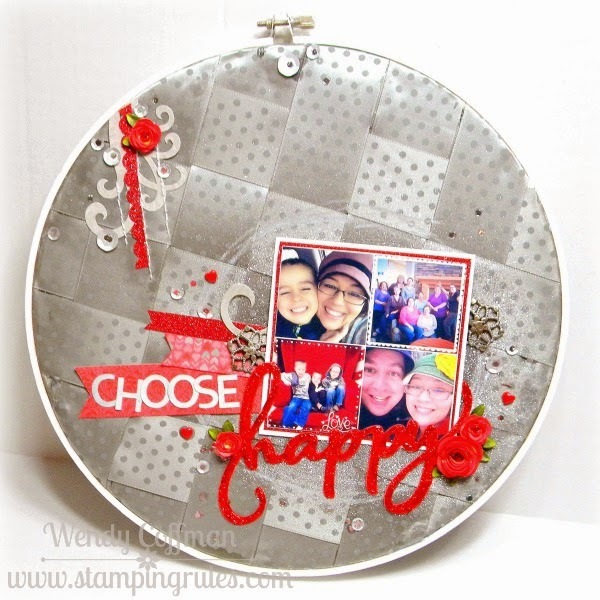 I added banners from the new Heartstrings papers, some leftover Heartstrings Complement stickers, silver sequins, and metal flowers from the Yuletide Carol assortment. The 3-D flowers came from Art Philosophy, and the HAPPY sentiment from Artbooking. 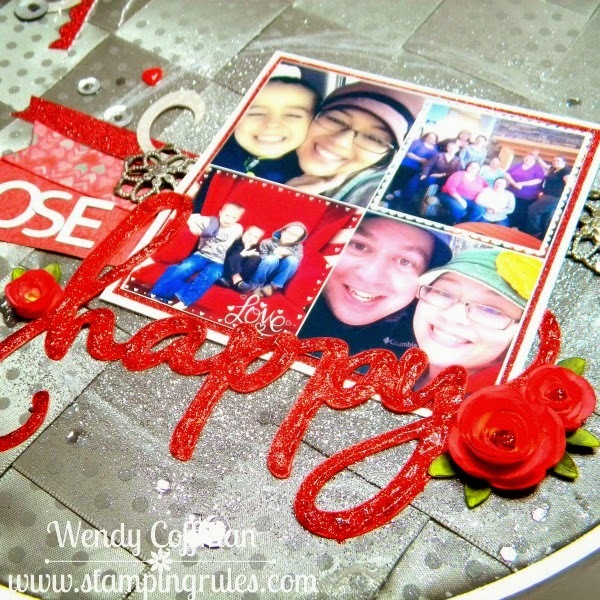 I added lots of red glitter gel to my title, and filled my 3-D roses with more glitter. It sparkles, and catches the light - I love it! Tomorrow I'll be back with the other Koala Card. Today, this made me happy! What a unique layout.... love it!!! Thanks for playing along with us at Sktchabilities...! !